Some of the world's finest vehicles come out of Europe and here at Oak Hill Automotive we look forward to servicing them. 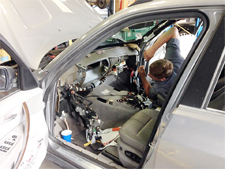 Our state of the art a auto repair shop in Austin is equipped with the tools necessary to work on the most complex automotive systems, not to mention our amazing mechanics who are extremely knowledgeable when it comes to European auto repair. We service most makes and models of European vehicles, including Audi, VW, BMW, Mercedes and Mini Cooper vehicles. If your vehicle is having trouble starting or a tough time getting started, we can get the problem resolved. We guarantee you and your car will both leave our shop happy! Call us to schedule an appointment for European auto repair in Austin today! As a full service auto shop we take care of all our customers cars, including BMWs. Whether you drive an early e36 or a brand new 7 series, we have the tools and knowledge to give your car the attention it deserves. Mercedes-Benz is one of the world's oldest auto manufacturers and we proudly service these vehicles. When your Benz needs factory service or is suffering from some sort of trouble give Oak Hill a call right away. We are able to provide 30/60/90K maintenance services for any vehicle. These services help keep the car healthy by providing preventative maintenance, such as belt & hose replacements and fluid flushes. We also complete routine oil changes, which are necessary for most vehicles between every 3,000 & 5,000 miles. If you drive a European vehicle be sure to have it serviced by the ASE certified mechanics at our AAA approved auto repair shop. We are a customer service oriented facility that knows the value of honesty. To request a quote or make an appointment for European auto maintenance in Austin call us at Oak Hill Automotive!